Her film career began as well, as she appeared opposite Elvis Presley in “Flaming Star” (1960), “The Wonderful World of the Brothers Grimm” (1962) and “7 Faces of Dr. Lao” (1964). But her most notable role came one year later with the NBC-TV sitcom “I Dream of Jeannie,” in which Eden starred as the title character opposite Larry Hagman, who portrayed an astronaut who discovers Jeannie’s bottle – she was trapped inside – on a beach after a space mission. 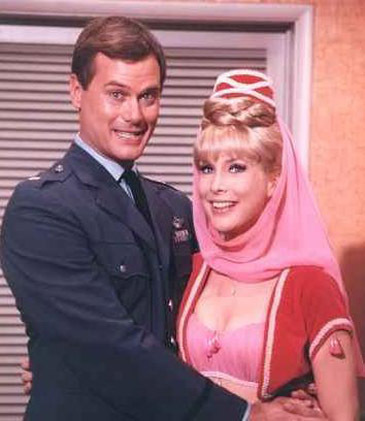 For five seasons, Eden would wear the revealing genie costume – which famously covered her navel – and get into antics with her “master,” Major Anthony Nelson. After the show ended in 1970, she continued a fruitful career with theater (“Woman of the Year”) and film/television (“Harper Valley PTA”), and she appeared with President Bill Clinton at a benefit in May of 2013, wearing her genie costume once again. Barbara Eden appeared at the “Hollywood Show” Chicago, an annual event in which fans can mingle, take photographs and get autographs from the celebrities who appear there. The next session of the “Hollywood Show” Chicago will take place in Rosemont, Ill., on August 15th-17th. For complete details and ticket purchase information, click here. HollywoodChicago.com: You came from simple roots on the West Coast. What was your motivation to get into show business and create that ambition that made you a success? Barbara Eden: It wasn’t really ‘success’ that I was looking for, I just liked to sing. I came from a family who liked to sing, and I started making appearances as a singer with West Coast bands. One thing led to another, and that’s what motivated my interest in acting. HollywoodChicago.com: You made so many appearances on legendary TV shows when you first started. Is there any performance that you catch in reruns that you particularly like or remember? HollywoodChicago.com: Larry Hagman told me that he got the audition for ‘I Dream of Jeannie’ because of the movie ‘Fail-Safe.’ Did you know Larry before he auditioned for the show? Eden: No, I didn’t know him at all. Sidney Shelton [Executive Producer] asked me if I would work with Larry because he was going to test for the part. Larry came down on one of my movie sets at the time, and we rehearsed there. That was my first encounter with him. HollywoodChicago.com: I’ve read that you weren’t happy when the producers decided to marry Jeannie and Major Nelson. Why do you think actors were not allowed that much input in those days, even though they brought the characters to life? Eden: Actually, I don’t think much has changed when it comes to that. [laughs] Writers and producers create what they want, and we have to act it, whether we like it or not. HollywoodChicago.com: You once did a TV movie called ‘The Feminist and the Fuzz.’ How do you think your life changed because of the feminist movement in the 1960s and ‘70s? Eden: I don’t think my life changed that profoundly, I don’t know. Most actresses are working for themselves anyway, and are independent, so I guess I was doing it all along. HollywoodChicago.com: You’ve done a lot of theater since your TV days. What do you love about the stage that you can’t get working in TV or film? Eden: It’s really apples and oranges. It’s doing a job, and doing it well, that’s what’s important to me. You do it differently on film and TV than you do it on stage, you do it differently if you are singing a song, as opposed to the spoken word. As far as I’m concerned, they are all equally challenging, and equally good. HollywoodChicago.com: When you wrote your memoir, ‘Jeannie Out of the Bottle,’ what did you want to clear up about your life that people might have had perceptions about? Eden: I don’t know. I don’t know if people have perceptions of my life or not. All I could do is tell it like it was, from my point of view. I been asked many times to write the book, but I didn’t want to do it for many years. It isn’t an easy thing to let people into your life, but I was told it was about time to do it. So I did it. HollywoodChicago.com: Finally, in 2013 you made an explosive impact on the internet, when you appeared once again in your genie costume at a benefit with President Bill Clinton. What do you think of the modern age of instant communication on the internet, and how did you react to the attention it gave you? Eden: Yeah, Wow, that was something wasn’t it? I’ll tell you, having to wear that costume again was something. [laughs] I didn’t expect to wear it, but I’m happy I did now. I was terrified – what would people think of me doing this? But it was for a great cause, and they made a good deal of money for that cause. And I was thrilled to meet President Clinton, Fergie and Elton John. I’d never met Elton, and I was tickled pink to get the chance.